A friend once described how excited her dogs became when they realised that they were going on a road trip. As soon as they saw their blanket being packed along with the family's suitcases, their ears pricked up, their tags wagged and they became sweet as pie (as opposed to the sulky slinking about when they realise that they'll be left behind). I am much the same when it comes to road trips. While flying is all very grand, there's fun to be had in driving you way to a destination and after last year's road trip across America I think I can take any length of time in a car. One of my favourite destinations is the South Coast of NSW which is easy and suitable for even the road trip novice. One Friday afternoon, Mr NQN and I set off and were joined by Belinda. 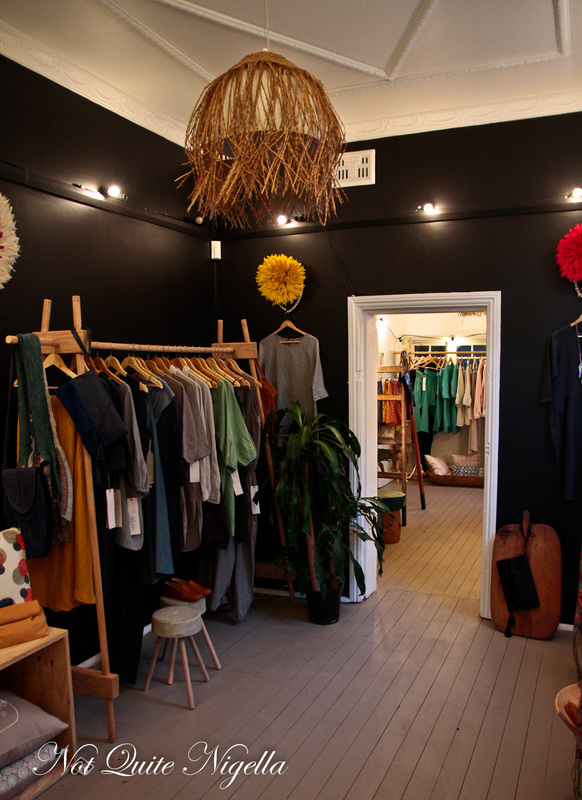 Our first stop is in Berry, a picturesque and postcard pretty town two hours' south of Sydney. Perfect situated at just the right distance for people who want to take a break, the town is always busy with plenty to offer tourists passing through or staying overnight. If you're looking for a cup of tea the Berry Tea shop is a must stop or a quick sugar rush can be found at the Berry Donut van. We found a couple of new places to visit on our trip. We are meeting up with Jacqueline Weiley of Foodscapes food tours whom we first met about 18 months ago. We kept in touch after our tour with her and today she is showing us two of Berry's newest businesses. 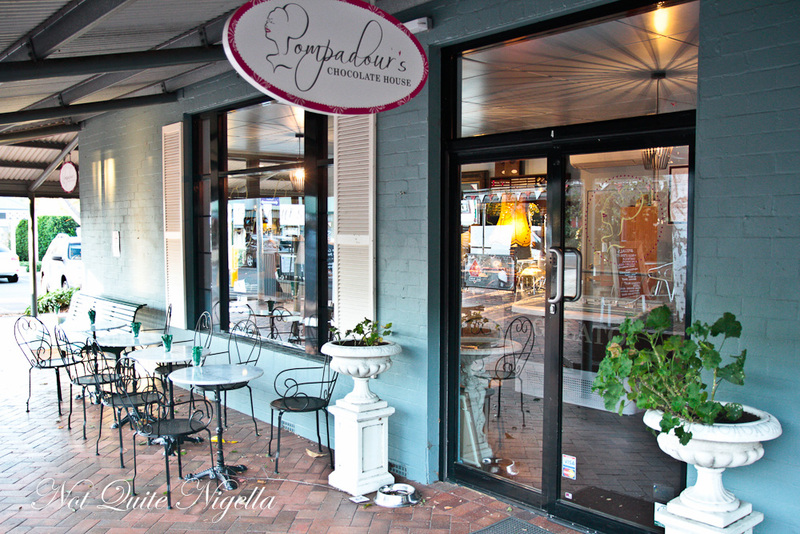 The first is Pompadour Chocolates a popular place to stop for a warming cup of hot chocolate or an awakening cup of coffee. 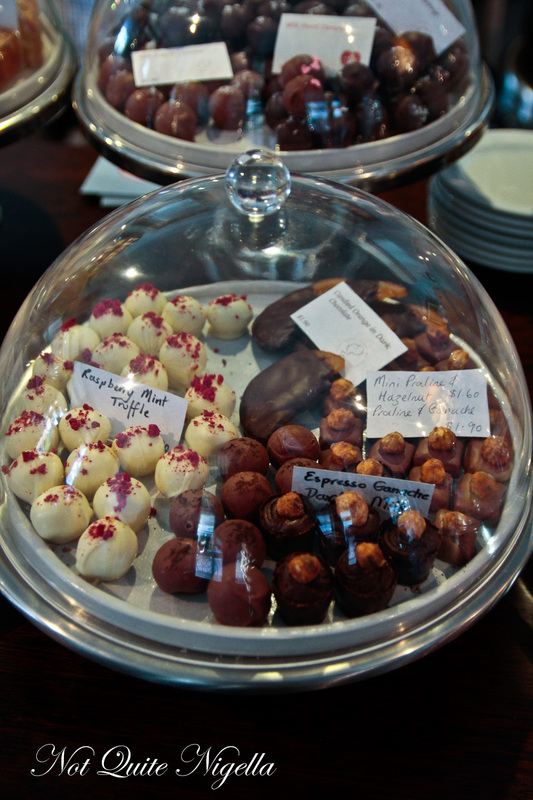 The majority of the chocolates are made by Belinda at Pompadour chocolates and they specialise in chocolate bark as well as pretty truffles. Their caramel sea salt chocolate enrobed in both chocolate features a tiny cluster of salt flakes. 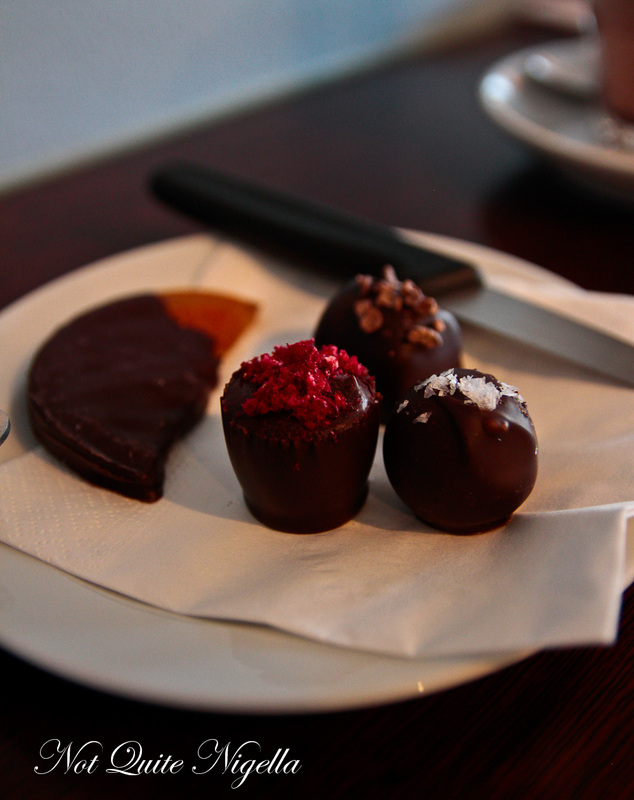 Plump Turkish figs are coated in dark chocolate while the raspberry truffles give a hit of fruity darkness. The hardest thing is to figure out which chocolates to order. Forgive me if I am stating the obvious but Il Locale means local and here at this artisan gelateria, local really means local. The main dairy ingredient of creamy gelato is milk and the milk used here is from The Pines dairy in Kiama where they specialise in non homogenised full cream milk. 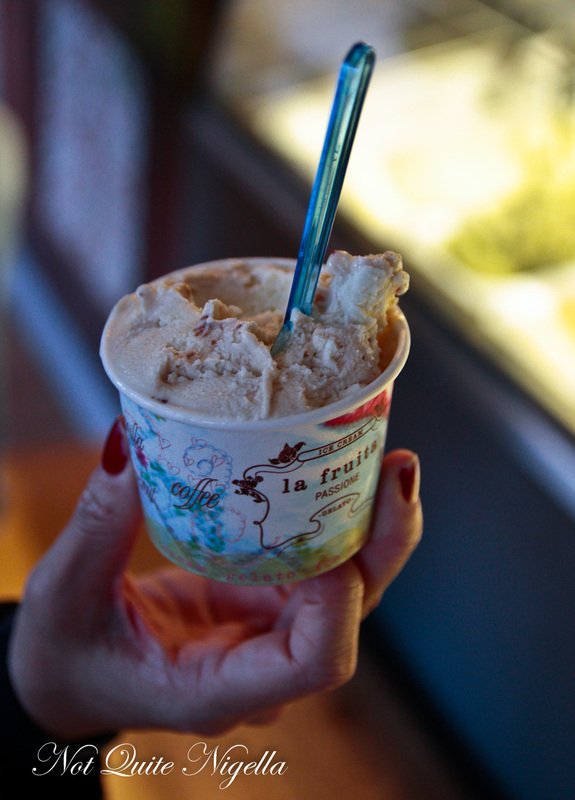 At Il Locale, customers can be eating gelato that was milked from the cow within 12 hours. The ingredients are also local from the nuts to the fruit and they also make coffee here too. 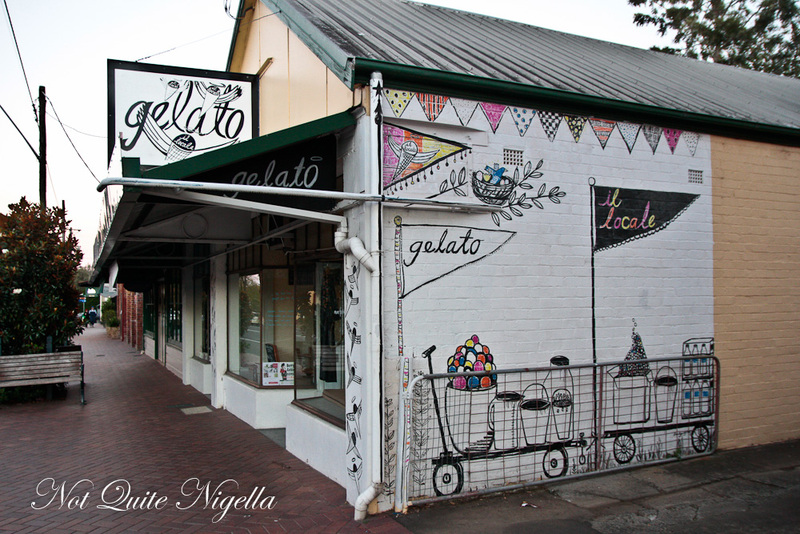 Damian and Josie Jennings opened the quirkily decorated gelateria in December 2013. 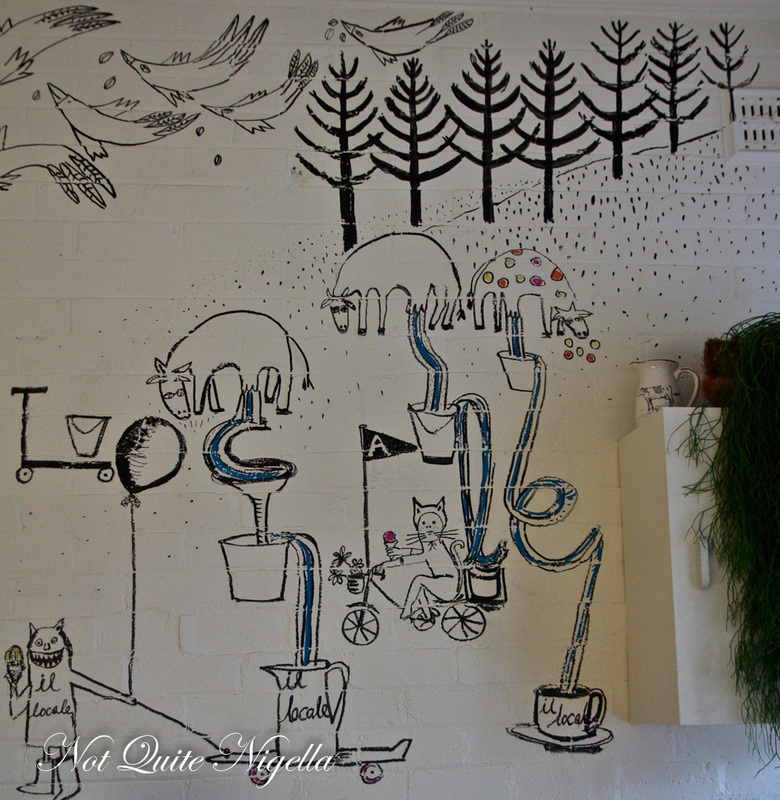 One wall features the story of the store in mural form from the pine trees to the little monsters aka customers that eat the gelato. The most popular flavour is the fig jam that reminds me of a scrumptious rum and raisin but is made of local figs. But my favourite is perhaps the lemon and ginger with a judicious balance of each. No flavour can really go wrong though and even while it is 7°C/44.6°F degrees outside and the winds are blowing people down the street, it's worth popping in. They say that safety lies in numbers but there are also other advantages to clusters. 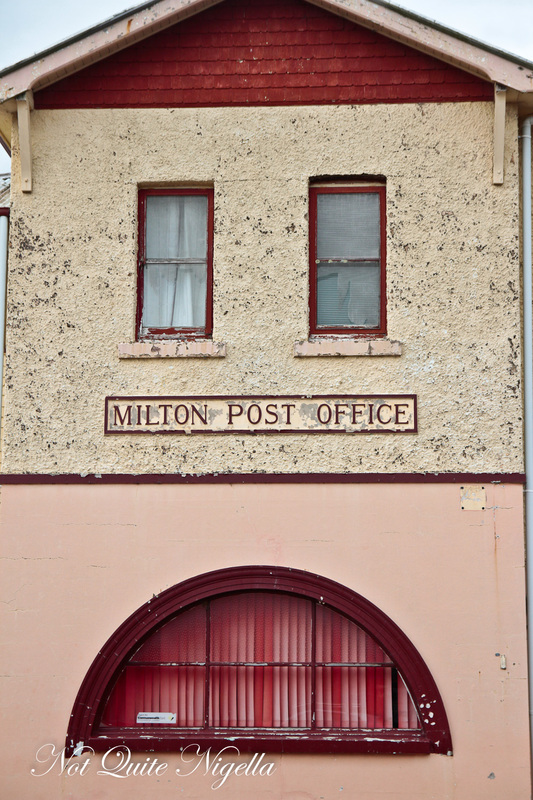 The three towns of Milton, Mollymook and Ulladulla lie ten minutes away from each other and each has a good range of places to eat. So much so that you feel as though you need a few days to explore all of them (and copious stomach space) or at the very least you feel spoiled for choice. 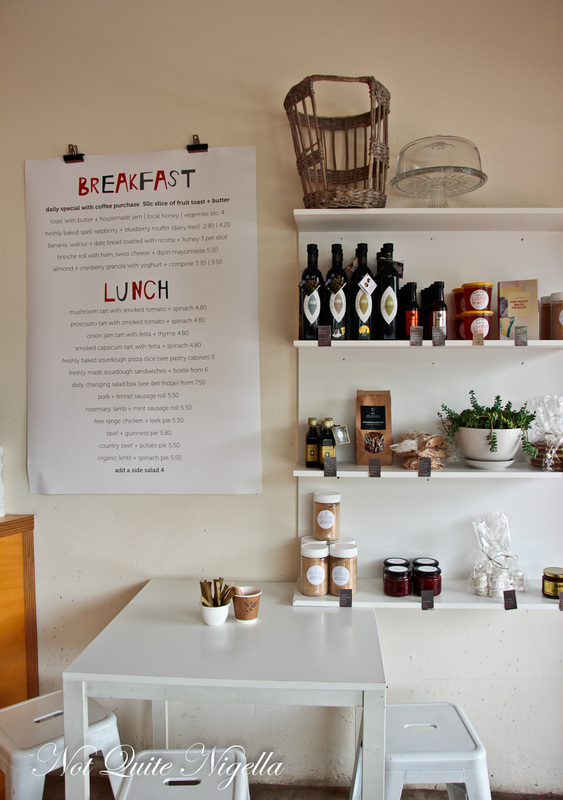 Breakfast or brunch can be had at the newest bakery in Berry. 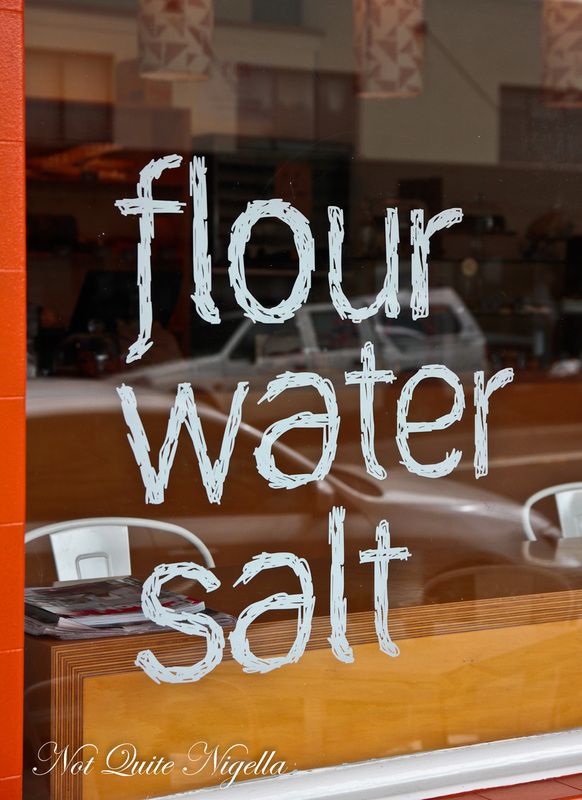 Flour, Water Salt sits on the main road of Milton. 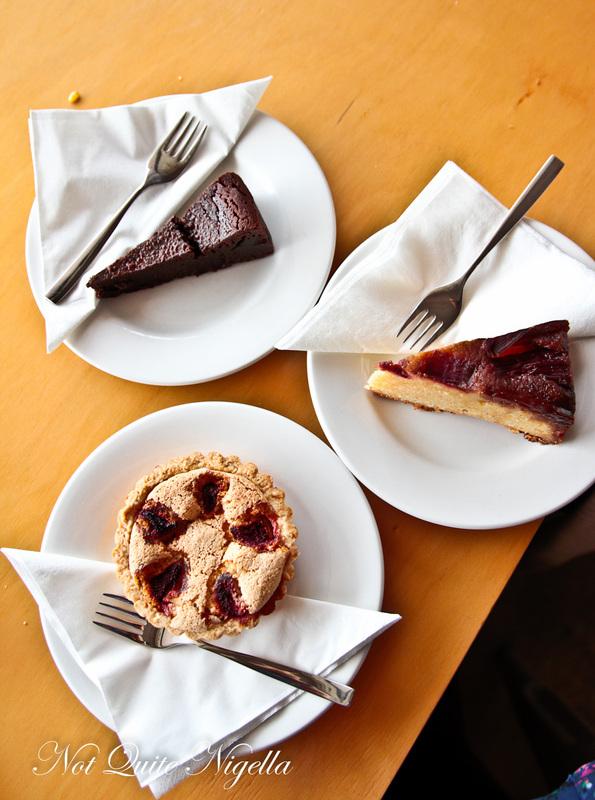 Their cakes, pies, tarts and pastries are made in house while Berry Sourdough supplies the breads. There are two outside seats and a bar seat facing outside. Given the cold, we are more than happy to soak up the warmth from the oven and aroma of the butter inside. We look wide eyed at the selection before settling on our order. A mix of pies, sausage rolls, pizza slices, ficelles, sandwiches and rolls are ordered and sandwiches can be toasted to order. 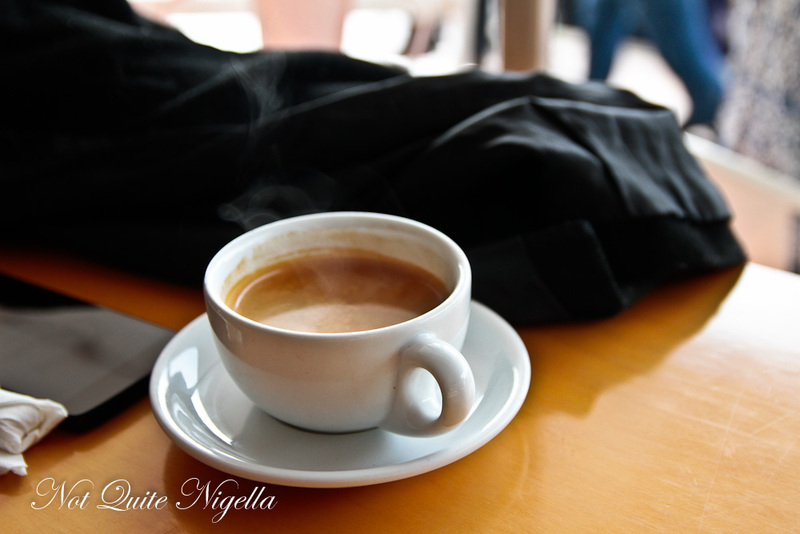 It is coffee for Belinda and Mr NQN while I go for a hot chocolate made using chocolate from nearby Bowral. It's just the right amount of sweet and the rich, dark chocolate is gratefully warming. 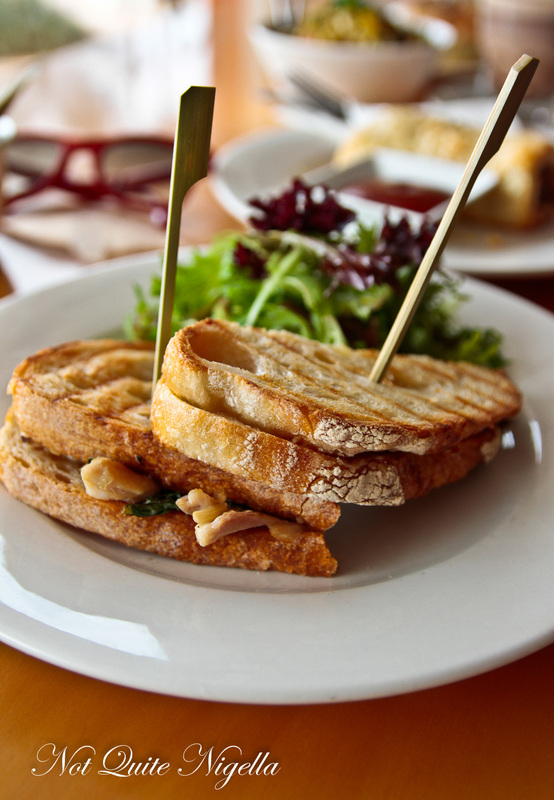 The SOHI sandwich is the most popular sandwich and SOHI stands for Southern Highlands where the combination of chicken, almonds and herbs is said to have originated. Toasted, the sandwich is moreish and filled with roasted chicken and given crunch from the almonds and a fresh flavour from the herbs. 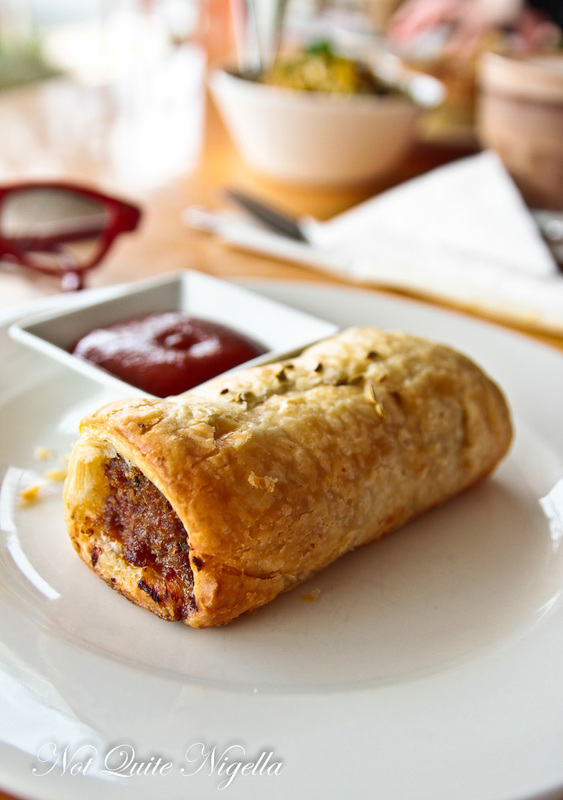 The pork and fennel sausage roll is rich and delicious. Made using cured pork that gives it additional flavour I think that it might be shock horror! even better without tomato sauce which obscures the pork flavour. 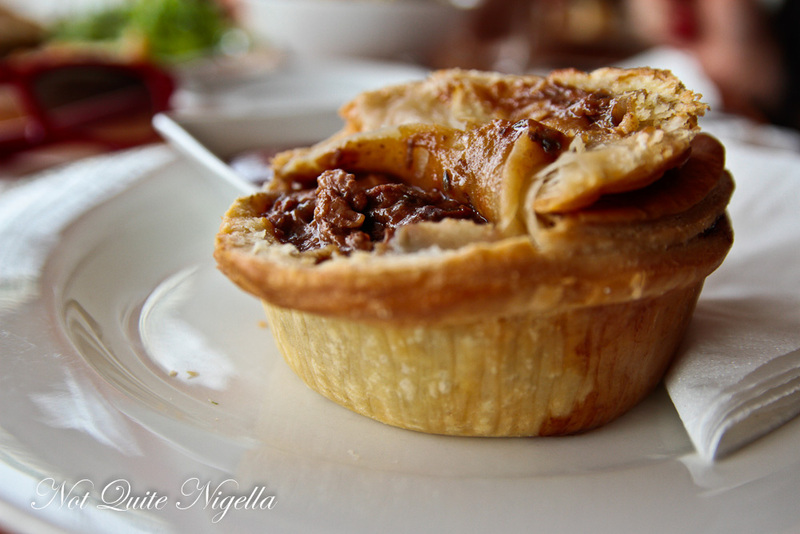 There are four types of pie on offer and we went with the most popular, the beef and Guinness which has large, soft chunks of beef and a distinct aroma of beer. The beer flavour is fantastic and the shortcrust pastry goes perfectly with the thick, dark filling. The freekah salad is nutty and fresh. 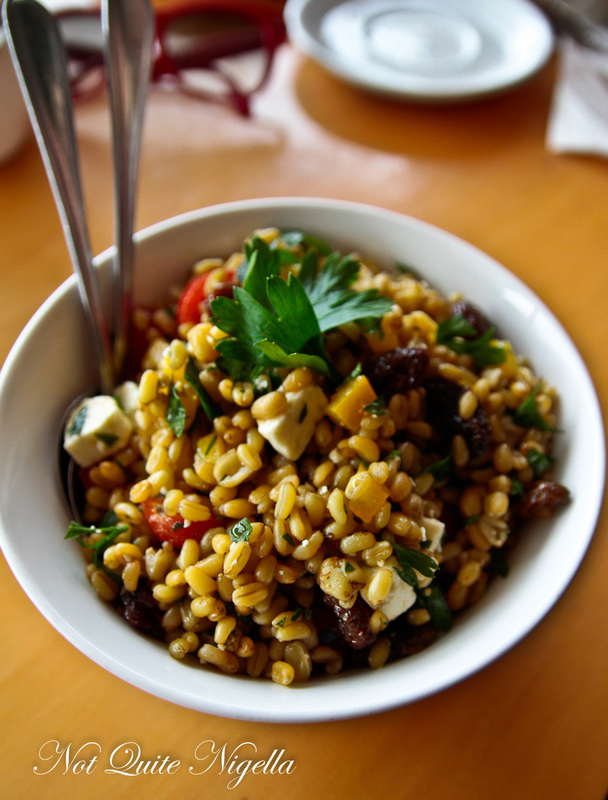 I like the freekah's addictive nubbly texture paired with halved cherry tomatoes, feta and sultanas. The chocolate espresso cake is wonderfully rich and dense. This gluten free number is also made using the chocolate from Bowral. The only tart that we didn't go for was the strawberry tart as it was quite dry and the tart shell was quite thick. The rhubarb coconut cake is much denser than originally thought and would be a great tea cake with the flavour of coconut and orange in the cake while being topped with sweet rhubarb. 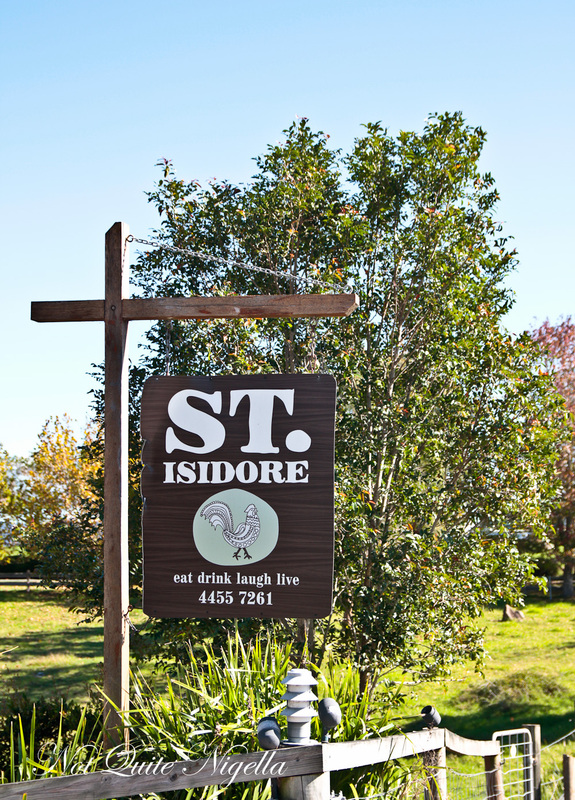 You can always tell how well regarded a restaurant is from the reactions of locals and every time someone asked where we were eating and I mentioned St Isidore there was a frisson of excitement and a confident assurance that we would love it. It is located a few streets away from the main street of Milton on a large, lush property just under two acres wide. A similar concept to Bowral's Biota Dining with an extensive working garden providing the restaurant with some of its produce, it's a restaurant assuredly worth the drive in itself. Chef Alex Delly and his partner Jo Thomas run the restaurant. Alex was born in Auckland, New Zealand to Greek immigrant father and New Zealand Irish mother. 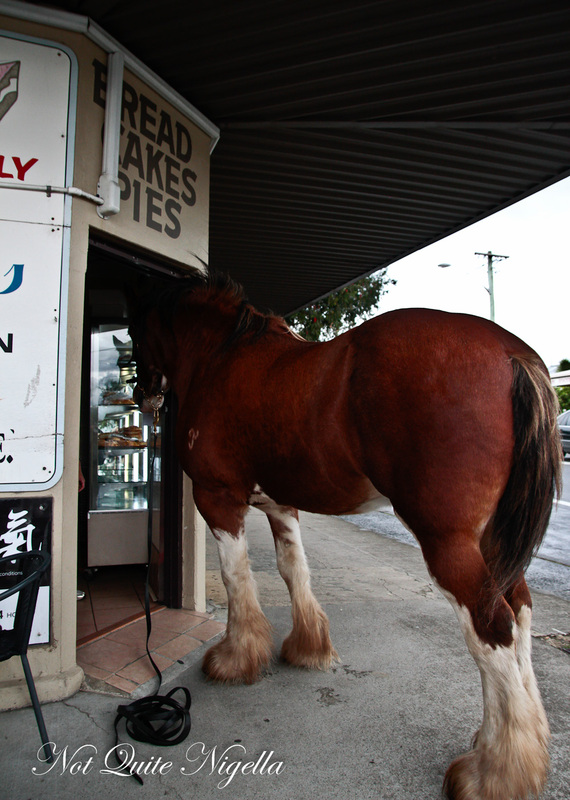 He grew up in Melbourne and worked at Ezard, Circa the Prince and Bannisters. While Belinda and I are deciding on what to order, the pen of well fed hens at a distance are sharing an enormous cauliflower. You need to have time for a leisurely lunch here and the hen's contented and picturesque lifestyle steer us towards dishes like "This morning's egg." 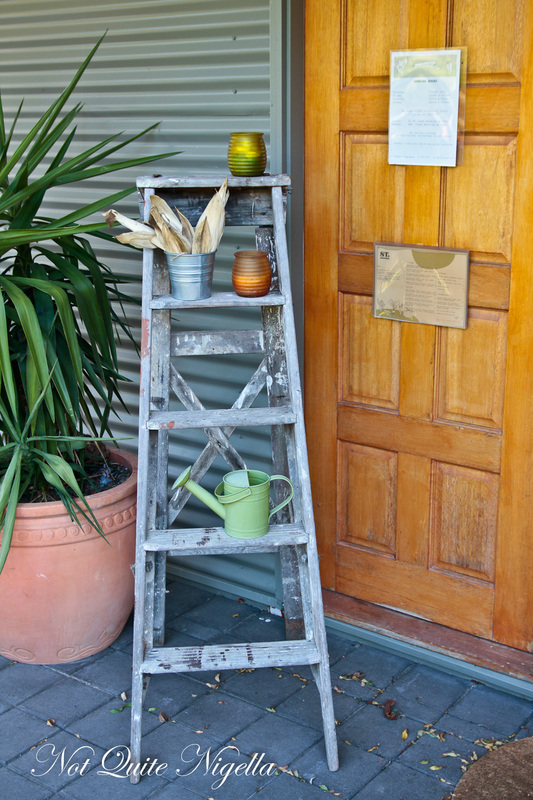 Each table is topped with some produce from pomegranates, butternut pumpkin or in our case a vase of pea tendrils. 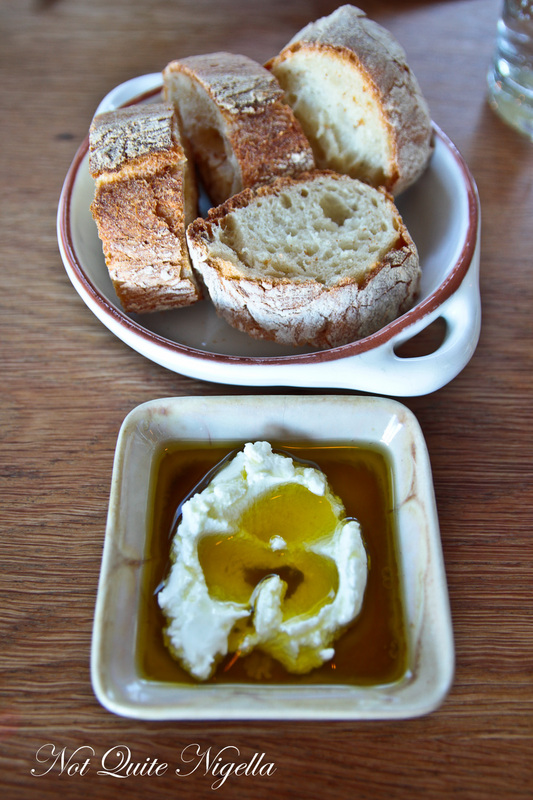 Bread is brought to the table with Victorian goat's curd and house infused parmesan and garlic olive oil. Service is deferential, warm and knowledgeable. The suppliers are local small producers. The photo doesn't quite convey how arrestingly pretty this dish is. It is made of a local kingfish sashimi with delicate pieces of blue swimmer crab, a creamy, smooth corn puree with five spice, radish and coriander. 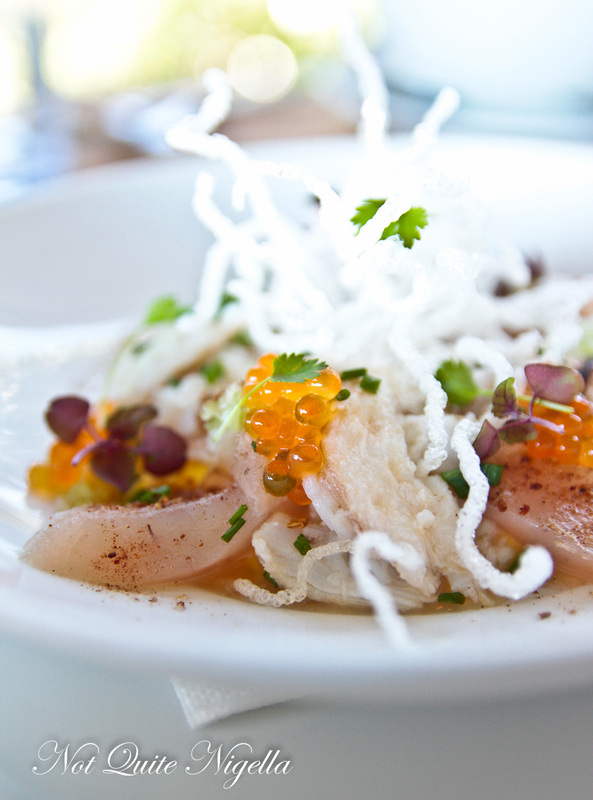 All of the ingredients serve to enhance the two stars of the dish: the kingfish and crab. This is actually a third of the serve as they divided it into three for us. 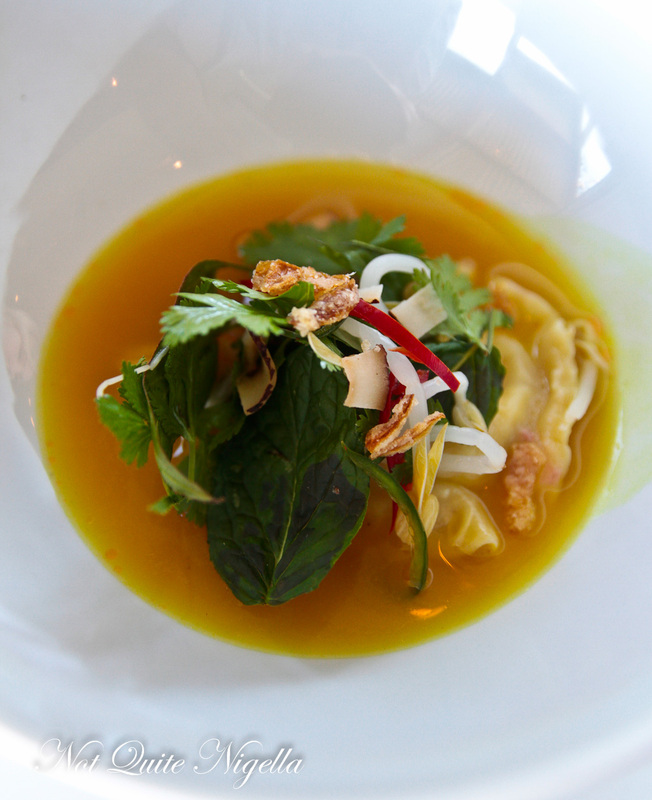 It's a plump prawn wonton in a fragrant and fresh bright yellow broth. The bean sprouts, shaved coconut and fried onions give it texture while the lime and mint give it a delicious freshness. The appearance of the puffed rice was a little alarming but I loved the creamy egg yolk against the crunchy puffed grains. 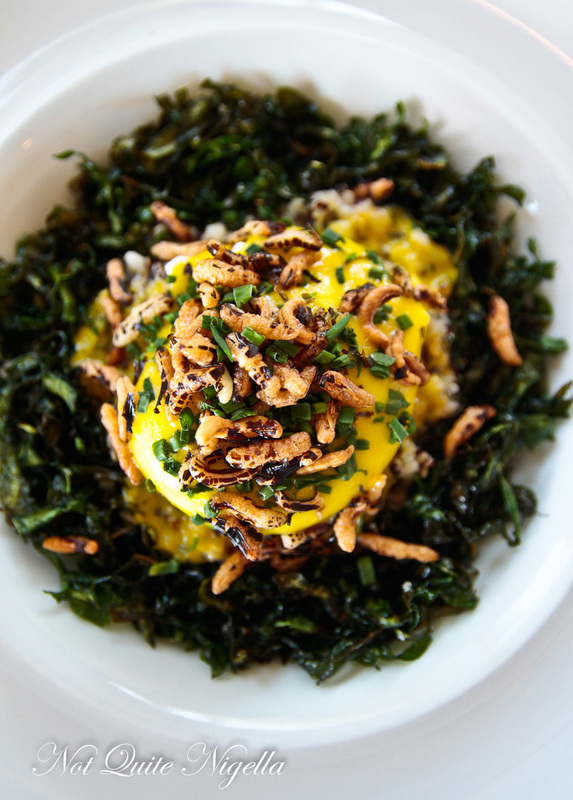 The crispy silverbeet, like a cousin to Chinese mermaid's tresses or kale chips are light and crunchy and the bearnaise reminds us of a breakfast Eggs Benedict. This is our last entree and it is a cracker. The slice of Berkshire pork belly has just the right texture from the crunchy crackling to the unctuous bottom meat layer (we find often one part is lacking in a sacrifice to cooking the other). 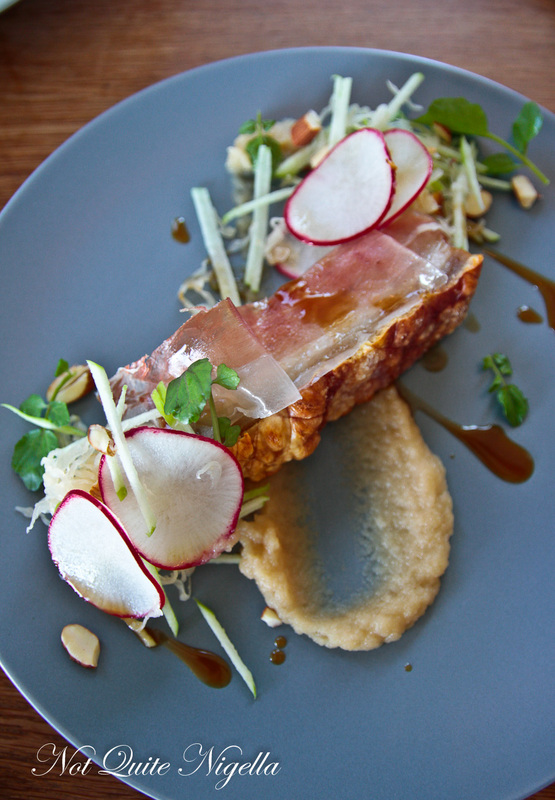 It is topped with a semi translucent slice of prosciutto, leaves of baby white onions and there's a good acidity from the white onion and cider puree, sauerkraut, radish and matchstick apple salad. This is our only main as we were getting quite full and I wanted to order the lamb because I always think that NZ born chefs just know how to cook it well-it's almost instinctive. We're not disappointed at all. The lamb neck is buttery soft like a confit and I split the soft meat to divide it. It is paired with a cucumber and radicchio salad with pickled onion to lift the rich meat but it's the shaklish that really does the job. And not a scrap of this goes back to the kitchen. I may have even run a finger over the plate at the end. 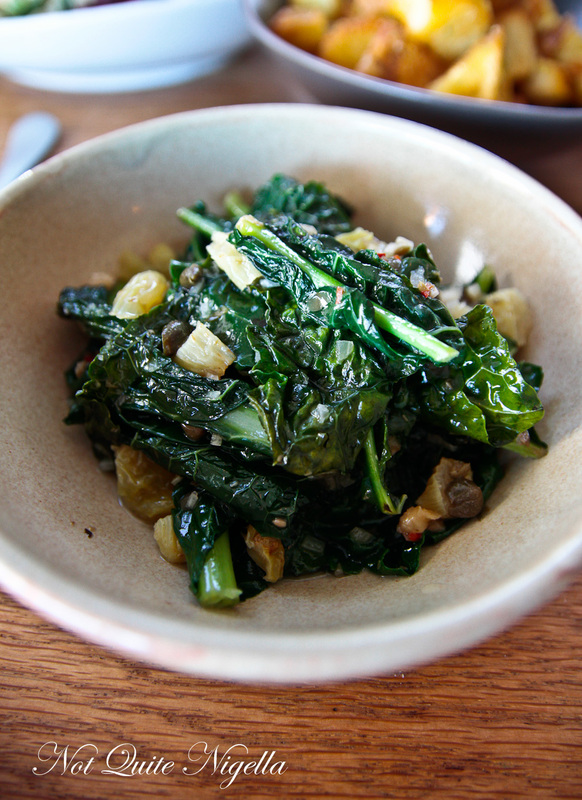 The Tuscan kale or cavalo nero is the leafy green today and it is dressing in a fantastic caper raisin dressing. You know when something looks so good and you wonder if it tastes as good as it looks? 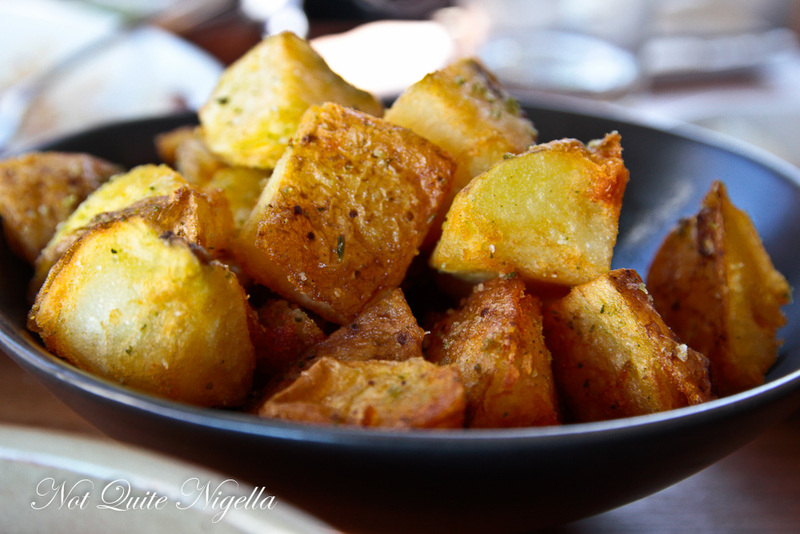 All of us love golden fried potatoes and these are so crispy and delicious that I find myself fishing in the bowl constantly. Low carb diet? What low carb diet? I spied the table next to us with this so we ordered it. It is three layers of crispy kataifi pastry filled with a creamy mascarpone mousse. 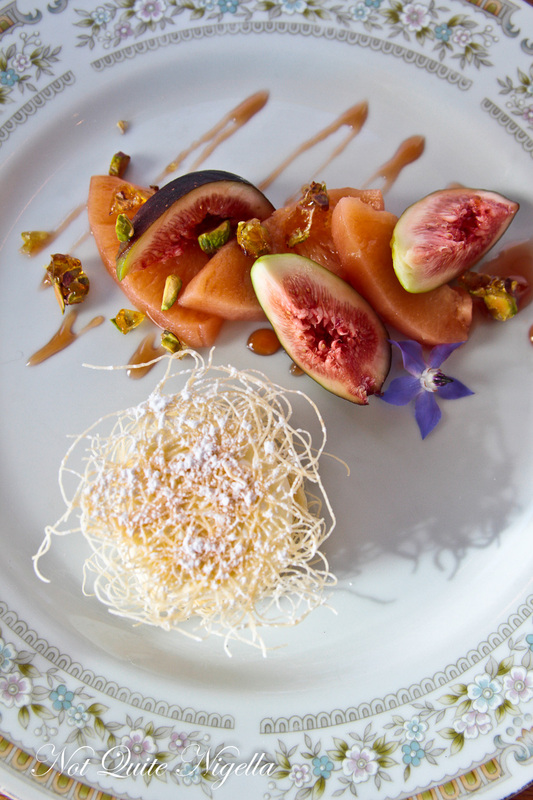 It is accompanied by a range of the last of summer's figs and poached quince as well as pretty pink and green pistachios. I'm going to get pushy here. I don't often go for chocolate naturally but I was swayed by the roasted peanut ice cream. 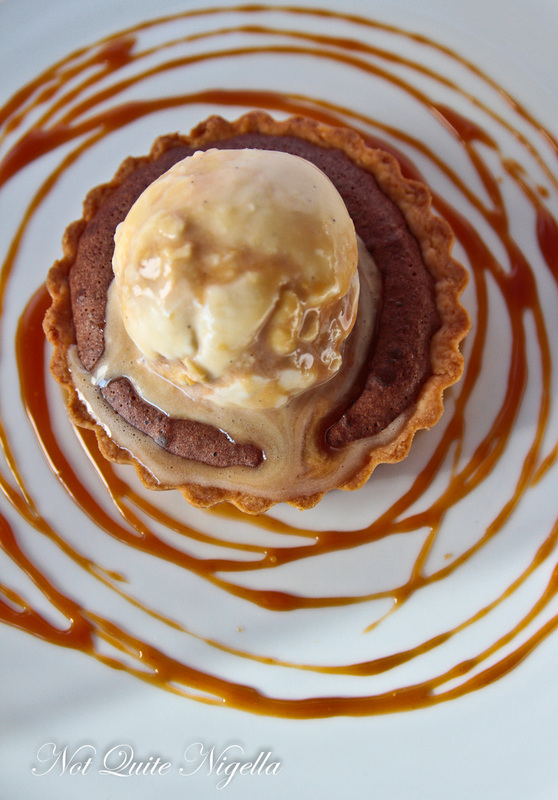 But you simply have to order this dessert because it will be one of the best chocolate tarts you'll ever have. 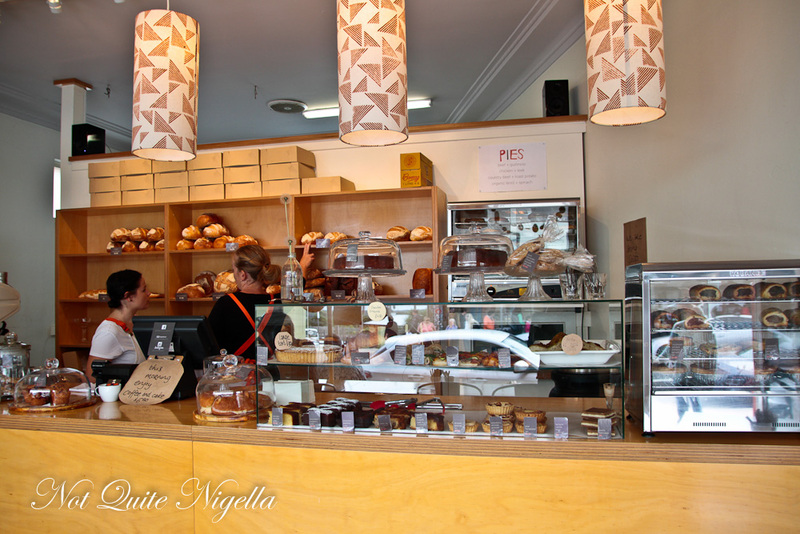 Baked to order (oh how I adore that Melbourne trend of baking things to order!) the shortbready crust is incredibly short and buttery and the crisp chocolate top of the tart reveals a light as air chocolate filling. The salted peanut ice cream is the perfect pairing. We end on a spoonful of this because that's what we want to taste on our lips that afternoon. Dinner is in Mollymook at Tallwood. 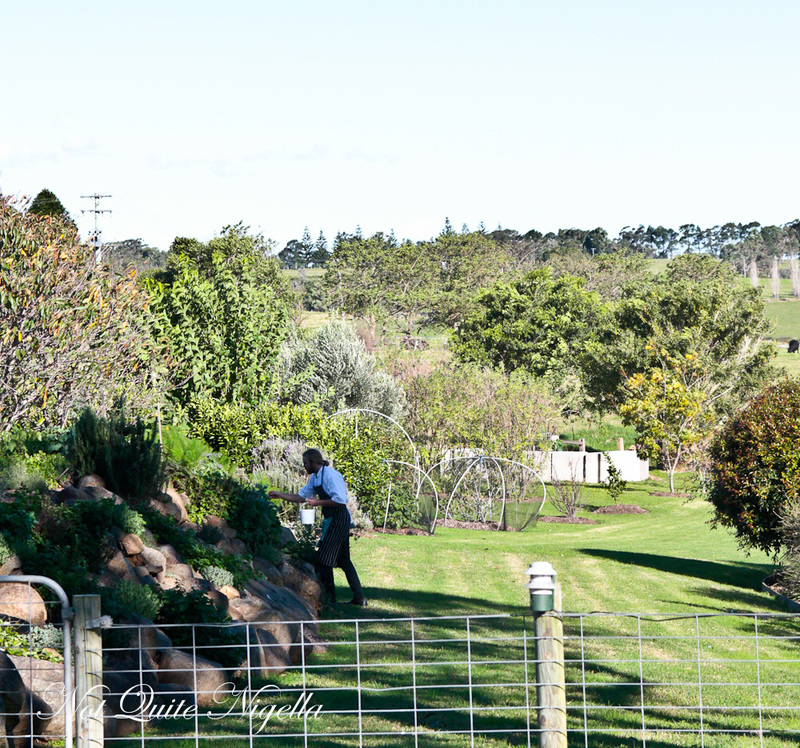 Owners Clayton and Matt first met as children in South Australia's Mount Gambier. They both trained as chefs both working with Chong Liew and Clayton went on to become a carpenter and then segued into a restaurant's front of house while Matt remained a chef. 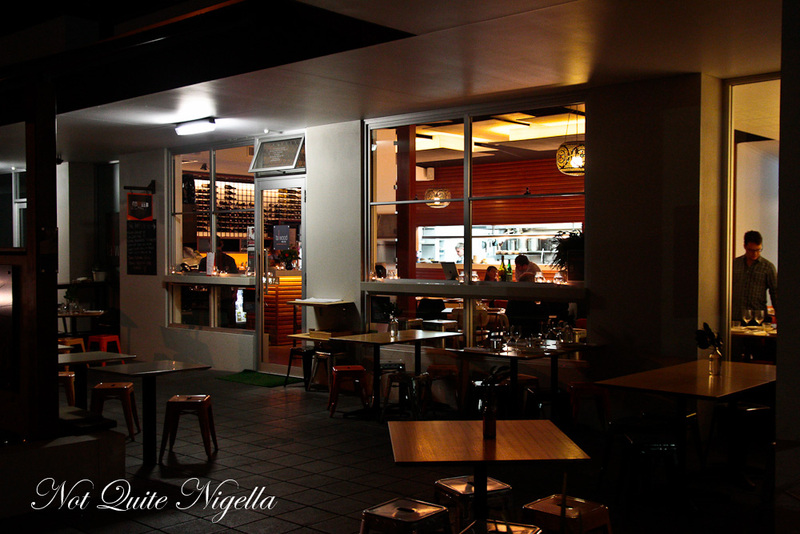 They opened up Merry Street Restaurant in Kiola in 2010 and then moved onto a new restaurant in 2013 called Tallwood, named after the street on which it sits. 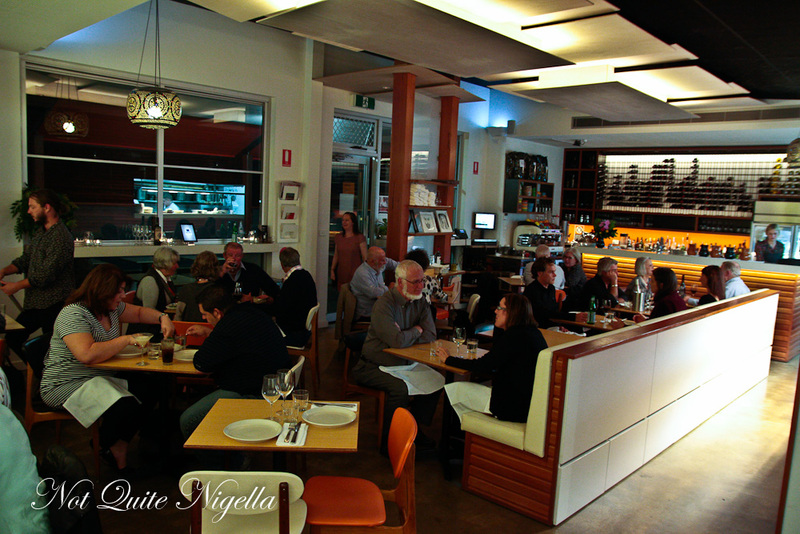 It's a warm, inviting restaurant and full of a mixture of locals and tourists this evening. All tables are taken and we take a seat against the banquette. The wine list is comprehensive, in summer it goes up to 140 wines and in winter 110 wines. We start with a wine from the Southern Highlights in Berrima called Tertini. 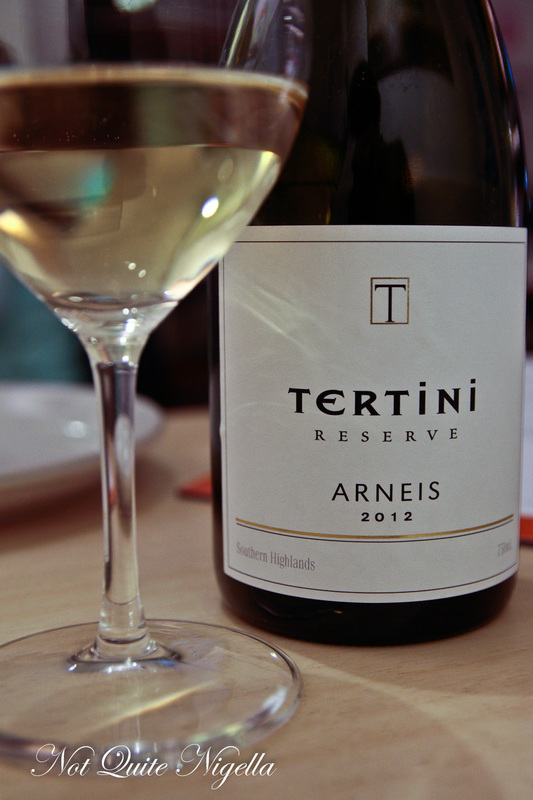 It's an Arneis (pronounced ar-nay), an Italian varietal and it's a very enjoyable wine. 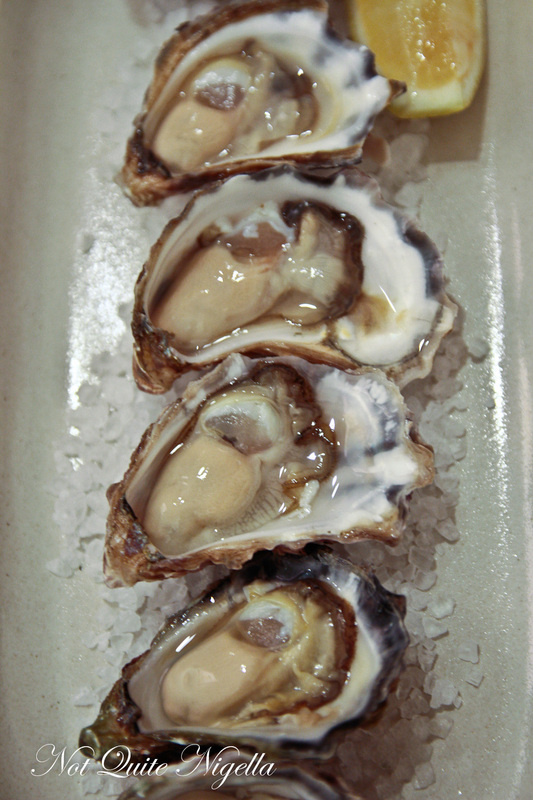 Oyster lovers will rejoice being on the South Coast because Clyde River Oysters are plentiful here. 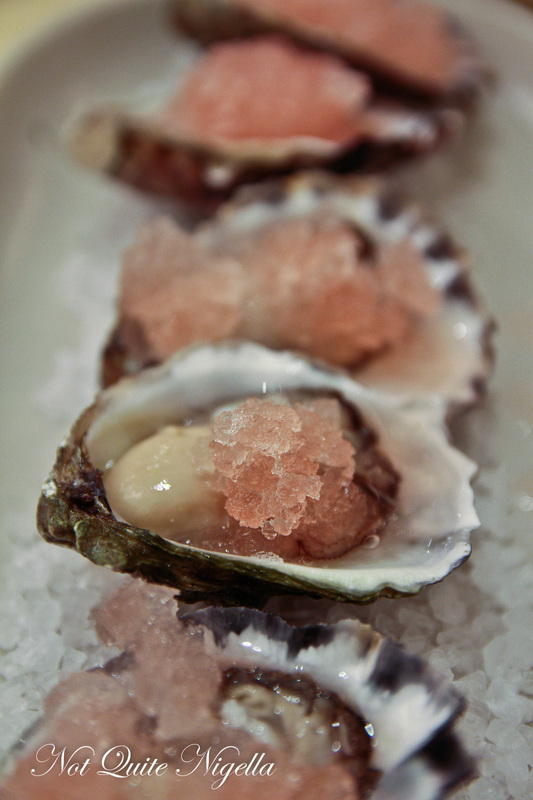 They're brought every day to the restaurant just before service and at Tallwood there is a range of preparation from natural, to topped with nebiolo granita to a finger lime and house made Tabasco. 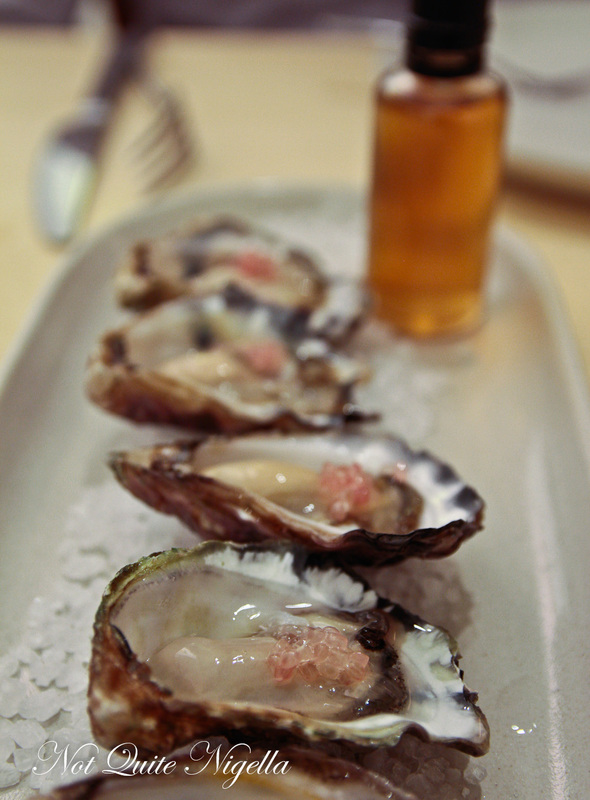 The Nebiolo granita really brings the freshness of the oysters to the fore but the finger lime and surprisingly mild house made Tabasco made using organic green chillies is intriguing. It comes out in a small bottle and they encourage diners to dispense six drops of the amber coloured liquid. Chef Matt Upson is keen to keep experimenting on the Tabasco using a smaller, hotter chilli next time. Each batch takes six months to make and they employ the use of oak and beer brewing techniques. Everything but the chorizo and black pudding are made in house. The Portuguese fish cake is made using ling that they salt themselves. 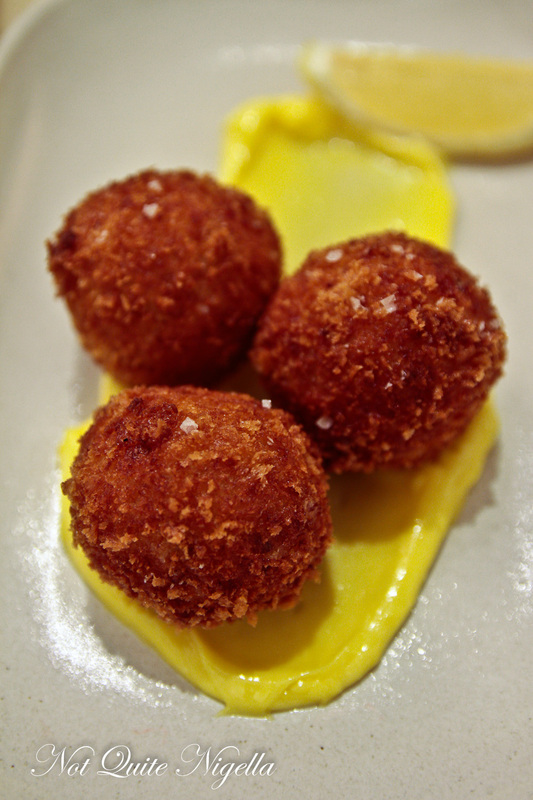 Crunchy and golden, it goes perfectly with the intense yellow saffron mayonnaise. This and the paella are the two dishes that their customers will not allow them to take off the menu. 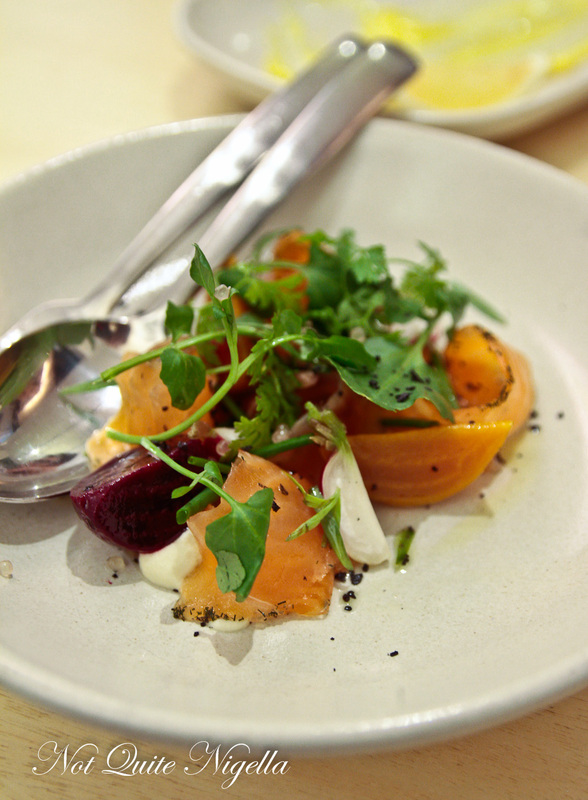 One of my favourite dishes is the house cured salmon which is a simple balance of flavours. The golden beets are roasted while the thinly sliced, cured salmon and fennel cream and light horseradish all combine perfectly together. Being a regional restaurant, often a customer will bring in fruit from their trees and the tamarillo in this dish is from a customer. 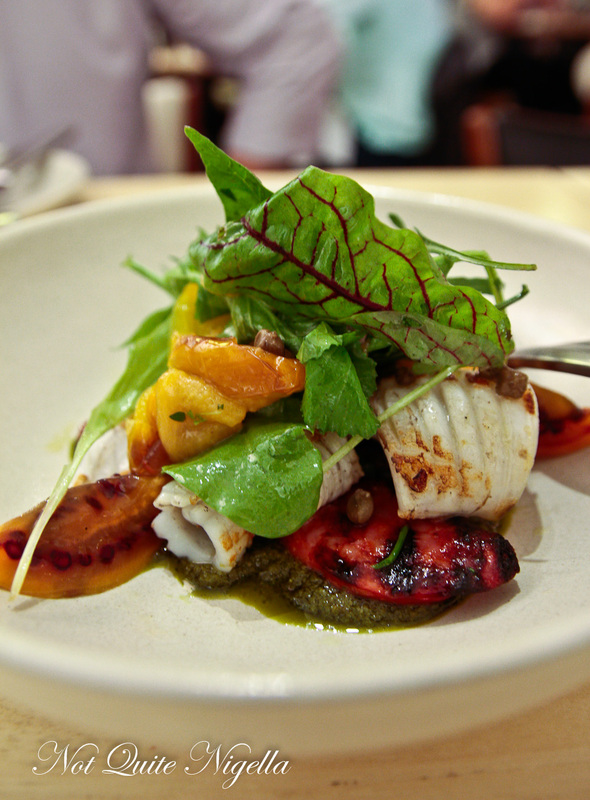 There are pieces of tender curled over char grilled squid, garlicky chorizo, baby capers, parsley, yellow capsicum and sliced tamarillo. 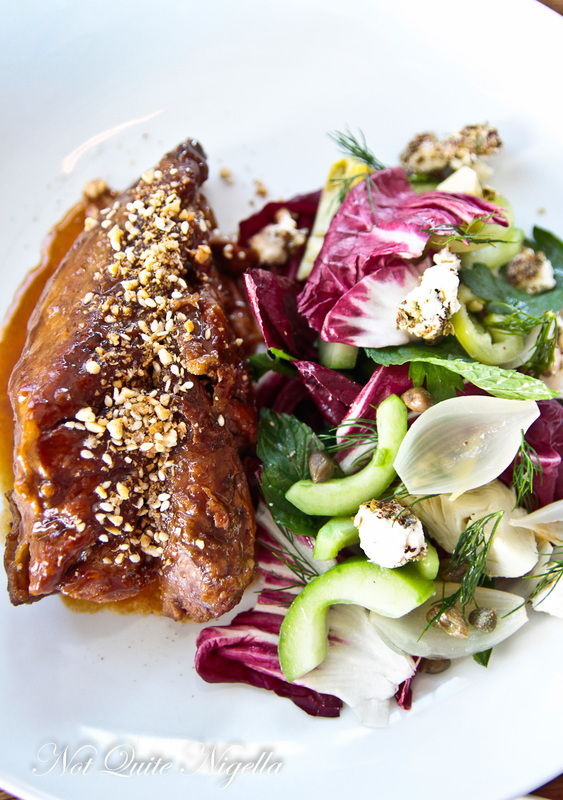 The flavours are appealingly strong in this dish. Meals here are designed to share and they come out when they are ready. 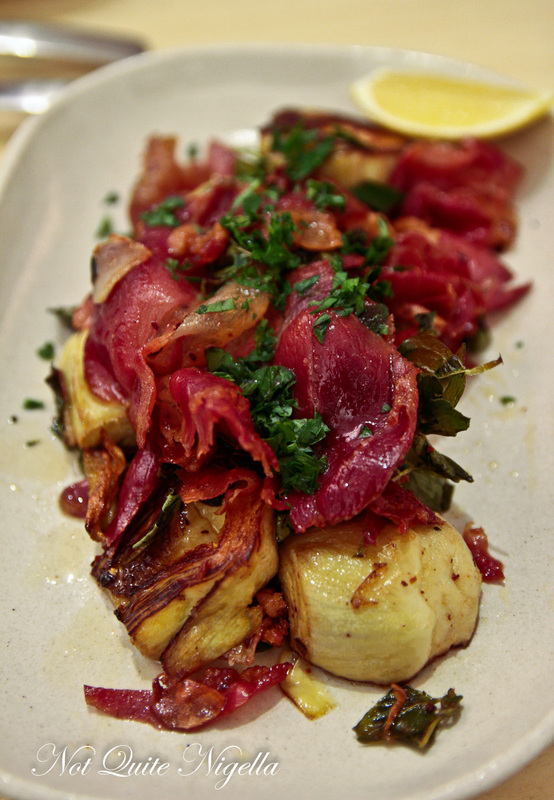 This is Clayton's favourite dish and it features pan fried artichokes, and a generous amount of crispy jamon, chilli and garlic on top. A wedge of lemon is given to cut through the rich and salty jamon. Of the mains, this was my pick. 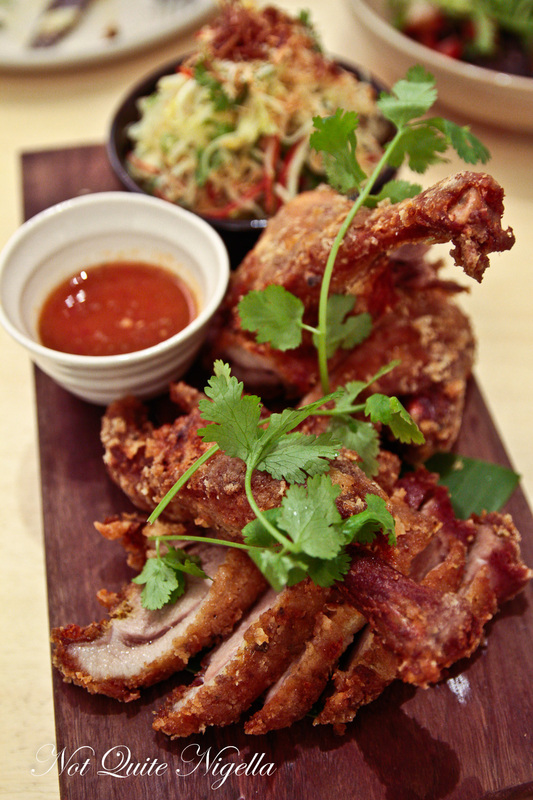 I love Balinese duck marinated in a range of spices and flavours. Here half a deep fried duck is deep fried until crispy with the drumsticks served on the bone with a spicy chilli sambal on the side. There's also a fresh wombok and glass noodle salad on the side. The pork shoulder is first confited and then made into a rillette before being stuffed and rolled into crackling. 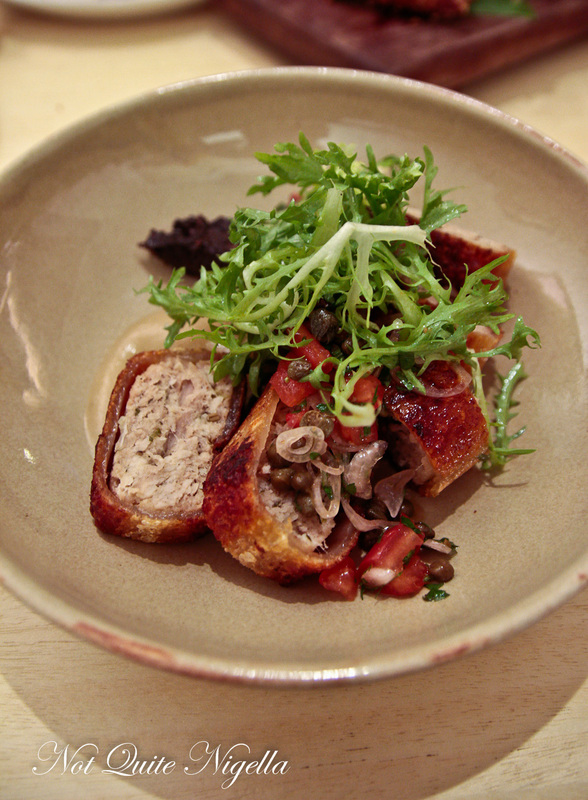 The result is deliciously soft meat encased in a crispy, sticky crackling outer. It goes well with the black pudding and sauce vierge (made with tomato, olive oil, lemon and basil). 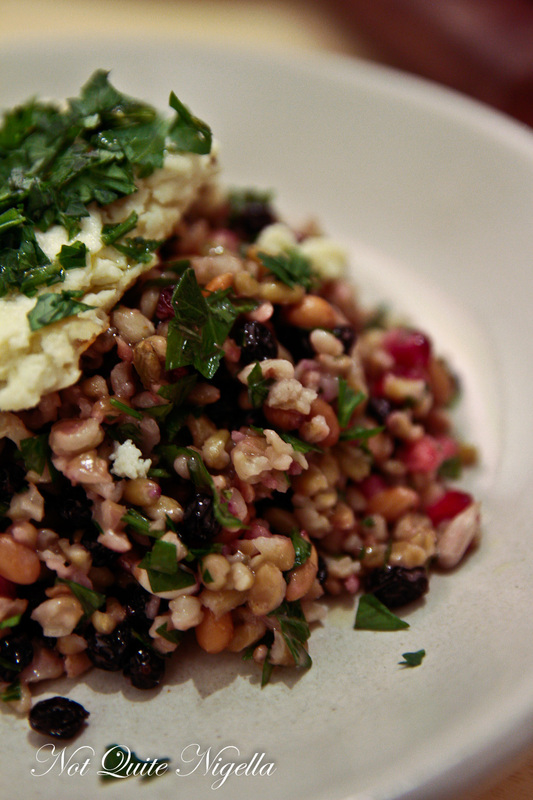 The side salad is a popular one here made which is a sweet and nutty combination made with bulghur, pomegranate arils, currants, pine nuts and roasted ricotta. Dessert time! The dessert chef Damian was formerly of Quay restaurants and Clayton explains that they deliberately keep the descriptions of dessert ambiguous to surprise diners. 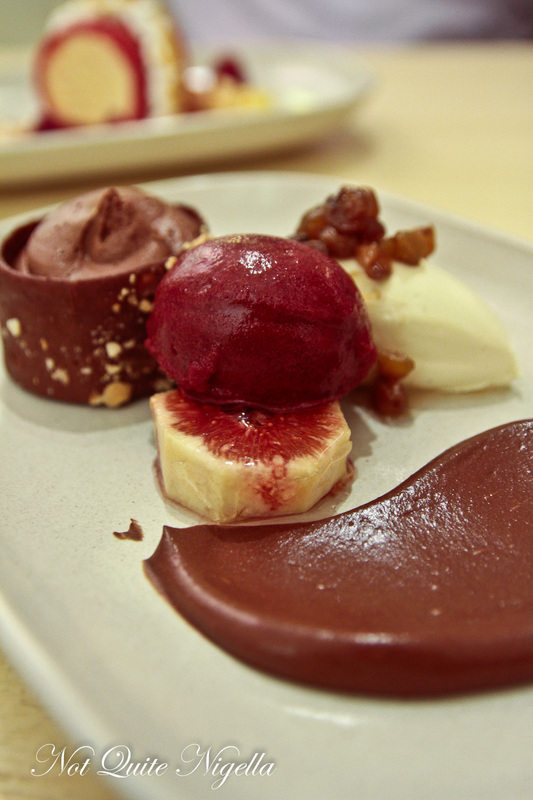 The chocolate dessert is made up of a chocolate and hazelnut mousse in a chocolate hazelnut tuile served with vanilla cream, cherry sorbet, a toffeed fig slice, chocolate gel and macerated raisins. I particularly like the mousse with the raisins together. Alas I got to this sort of when there wasn't much left so I'm not sure that I got all of the components. 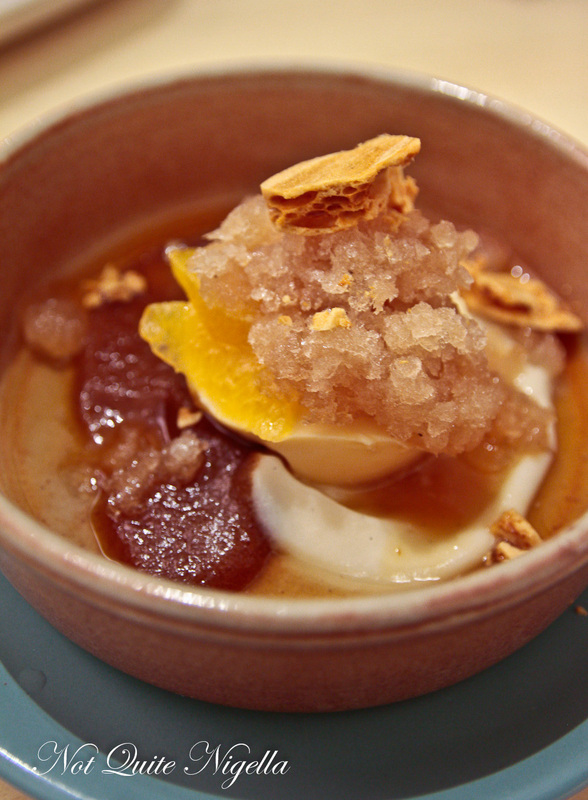 It is a creme caramel with a fragrant Lady Grey tea granita and an almond milk gel, date puree and honeycomb. Whilst almond milk is nice enough as a milk substitute, it doesn't actually add a great deal of flavour to a dish. The rice pudding is studded with currants and is good although I do like it a bit richer and creamier. 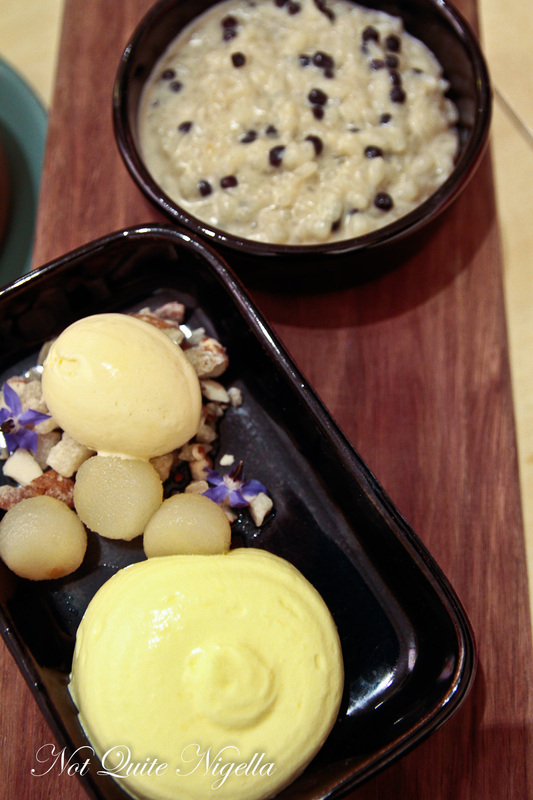 The saffron sabayon, pear balls and packham pear ice cream with the almond praline however is delightful and that to me is a dessert in itself. 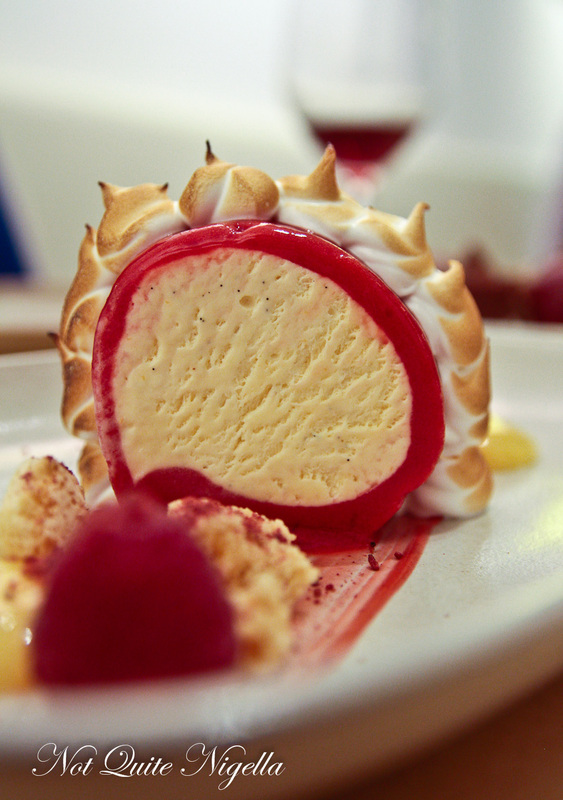 The bombe alaska is pretty as a picture. With a vanilla speckled centre and a raspberry outer it is laced with meringue drops and comes with dollops of lime curd and shards of crisp meringue. And should you need it after a night of wine and food, our accommodation at Bannisters has a car that will happily pick guests up and drop them off so that they can enjoy a night out! So tell me Dear Reader, how often do you go on road trips? Do you have a favourite destination or area to visit? And where would you have a holiday home if you could have one anywhere?